The Boston Marathon has always been a special event for locals, since it takes place on Boston’s own holiday: Patriots’ Day. Always the third Monday of April, Patriots' Day commemorates the first battles of the American Revolutionary War. Not only does the Boston Marathon occur, but the Red Sox play an 11 a.m. game, and most people who have the day off from work hit the streets and the bars to have a good time. It’s an even more significant event in this resilient city since the bombings at the marathon finish line in 2013. The Boston Marathon allows more than 36,000 runners to cover 26.2 miles, starting outside in the suburbs and ending in Copley Square. Given the holiday and the race's renown as the oldest continuous and one of the best marathons in the world, hundreds of thousands of spectators join in the festivities, as well. Looking for tips for experiencing the race as a participant or as a fan? Here are some things you'll need to know. Getting to Boston is pretty easy. Logan Airport serves as a focus airport for JetBlue and a smaller hub for Delta. You can fly non-stop into Logan from most major cities in the United States. Be aware that flights could be slightly more expensive than usual because of demand for this holiday weekend event. T.F. Green Airport in Warwick, Rhode Island, is also within an hour's drive if you’re looking for an alternative airport. The easiest way to search for flights is with travel aggregator Kayak. You can also drive to Boston from other places in the Northeast. It’s an hour drive from Providence, under a two-hour drive from Hartford and Portland, less than a three-hour drive from Albany, a three-and-a-half-hour drive from New York City or a five-drive from Philadelphia. There’s also Amtrak rail service in the Northeast Corridor starting in Washington, DC, and making stops in Baltimore, Wilmington, Philadelphia, New York, New Haven and Providence along the way. The train usually takes as long as driving in a car, since even the high-speed Acela doesn’t actually go that fast. Bus service from operators such as Greyhound, Megabus and Bolt Bus is offered to Boston from major cities, as well, but adds at least an hour to the trip. 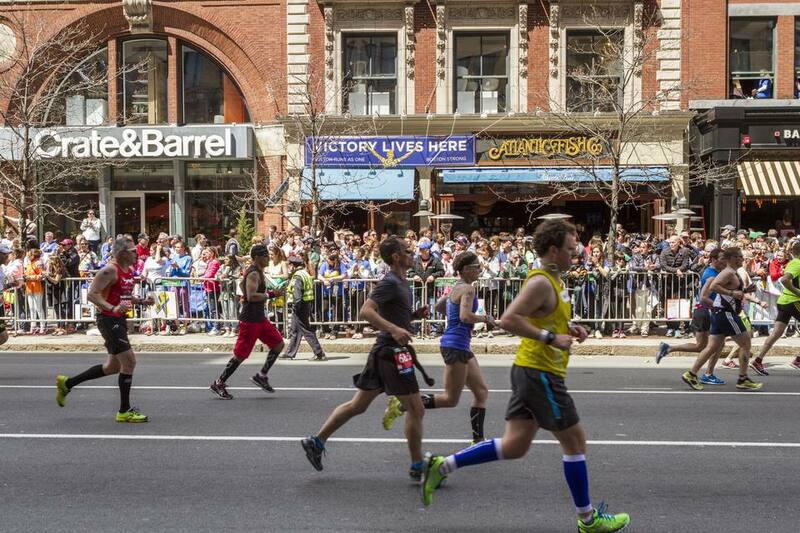 Boston is a major city with many hotels, but rooms fill up quickly for the Boston Marathon, and hotels increase their rates because of the demand. You’ll likely want to stay near Boston Common or Boylston Street, so you can explore Boston's top sights during your stay. Major hotel brands with a presence in Boston include Four Seasons, Hyatt Regency, Marriott, Ritz Carlton and Westin. If you want to stay closer to Faneuil Hall and farther away from the race, there’s the Boston Harbor Hotel, the Hilton or the Marriott Long Wharf. Or for something unique, consider the Liberty Hotel: a Luxury Collection property that was formerly a prison. It's located closer to the Charles River. The area down by the Seaport has really exploded in recent years, and there are a few brand name hotel options there as well including the Intercontinental. Increasingly, locals take advantage of the influx of people by offering up their apartments or houses for rent. You can look into those options with Airbnb, HomeAway or VRBO. This could be an opportunity for savings, particularly if you are staying longer than the weekend. Racers focus on their diets leading up to a marathon, and Boston’s restaurant scene is diverse enough to provide healthy options. If you're a runner who must be mindful of your intake before the race, save the more diverse restaurants for a post-marathon reward. Italian food is a favorite as runners look to “carbo-load” before a race, and there’s plenty of Italian fare on offer. The North End, Boston’s Italian neighborhood, can’t be reached directly by public transportation, but it is a short walk from a couple of T stations and easy to reach via taxi. Dolce Vita, Giacomo’s, Lucca and Mamma Maria are all really good options for a traditional Italian dinner. You probably won’t want pizza before the race, but after the race, there’s also Regina Pizzeria, which is a Boston staple for piping hot pies. The lines can go down the street during busy times. Save some room for dessert while you’re in the North End, so you can enjoy the cannolis at Mike’s Pasty or Modern Pastry. Locals are split between which they like more. There’s plenty of good seafood around town, as well. Legal Sea Foods is the iconic Boston seafood chain, but you may enjoy your seafood more at The Chart House or Island Creek Oyster Bar. There’s also Neptune Oyster or Union Oyster House if you don’t mind battling the lines. The burgers at the Four Seasons Hotel are upscale, but truly deliver. The burger offerings at The Butcher Shop in the South End aren’t as fancy, but they are just as good. Galleria Umberto and Santarpio’s compete with Regina for the best pizza in town. It’s hard to secure a reservation at Myers + Chang, but the assorted Asian fare keeps customers happy. Toro is an award-winning restaurant specializing in the small plate experience. No. 9 Park has been around for a while now, but its European-influenced menu has held up as well as anything in the city over time. Finding a restaurant reservation might be tough, as people plan well in advance for their night-before dinner. Open Table is often the best way to book reservations for participating restaurants. Those that aren’t listed generally have online reservations systems on their own websites or accept bookings over the phone. Runners are generally advised to stay off their feet on the days leading up to the race, but that doesn't mean missing out on Boston experiences. The Red Sox always play at home during the weekend before the Boston Marathon, so you can head over to Fenway Park: one of America’s best ballparks. It’s also playoff time for hockey and basketball, so you might want to check the TD Garden schedule for a Bruins or Celtics game. You can also see city highlights on a Duck Tour, catch a show, see a movie or go to a comedy club. Just save things like the aquarium and museums for another time. Make sure you study the Boston Marathon route before you choose a cheering location. The map shows subway stops, so you can take the T and avoid traffic. Track specific runners you’re following with the mobile app, so you know where and when to spot them. Dress in plenty of layers. The weather can vary over the course of the day in April, and you’ll want to be prepared for anything. You can always shed layers if the sun comes out. The best time to get to the bars near the finish line is around 10 a.m. The atmosphere is great in that area as the top runners approach. Move away from the finish line as the day moves on. The area near Kenmore Square becomes a lot of fun once the Red Sox game finishes and the two drinking crowds combine. Just be prepared for it to be very busy. Beacon Street before the race reaches Kenmore Square is a perfect place to spy friends and family who are participating. There’s a good crowd, but it’s not overcrowded. There are many areas to post up along the rail and cheer your people on. A lot of drinking is done on the streets, but you need to be careful if you imbibe. Fines are typically $200 if you’re caught drinking on the street during the race, as there are open container laws in Massachusetts. Don’t use red cups or clear plastic cups. Also note that containers of one liter or more of liquid are banned. Find a porta-potty as soon as you get out to Hopkinton. Athlete Village can be overwhelming with a lot to take in, but try to be smart so that you are set when the race begins. Women should remember to bring tissues or toilet paper. Porta-potties along the course are not always reliably equipped. Do your best to keep at your pace when the race starts. Runners tend to let the adrenaline take over and start too fast. That’ll hurt you, especially in the Boston Marathon with the hills coming in the second half of the race. Hydrate as much as possible before and during the race. The last thing you want is to be dehydrated when you’re pounding out 26.2 miles. The adrenaline really kicks in when you hit Wellesley College at Mile 13. That’s when you’ll be enjoying yourself the most. Use that to keep yourself motivated. You’ve probably heard of Heartbreak Hill, a stretch of the race between Mile 20 and 21 near Boston College. It’s the last of four hills over a 4-mile stretch, but there’s no reason you can’t handle it. Don’t run too fast on the downhills, and you’ll have something left. Make sure to have friends and family supporting you near the finish line, so they can meet you farther up Boylston Street when you finish.